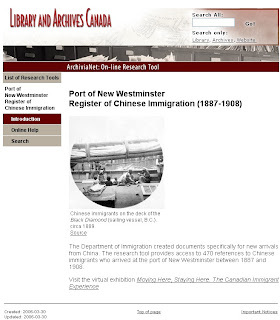 Port of New Westminster of Chinese Immigration which was in operation from 1887-1908 is a clearinghouse containing the Chinese Immigrant names that registered and paid the head tax in British Columbia during the years 1887 to1898, 1907 and 1908. According to the the website, this is the only port register that is known to have survied. The database provides information about the country origination, age, last place of residency, occupation, port of arrival and much more. You are allowed to view, print the documents for your record, and/or save a digitized copy of the document to your computer without charging you a penny. If you have Chinese ancestry that you could possibly have immigrated to Canada click here to be redirected to the site. Enjoy your search.